Rim Chung tying the RS2 fly is shown at www.rs2fly.com or download a .pdf file Tying-the-RS2. Photo sharing courtesy of Ferenc Horvath from www.rs2fly.com. 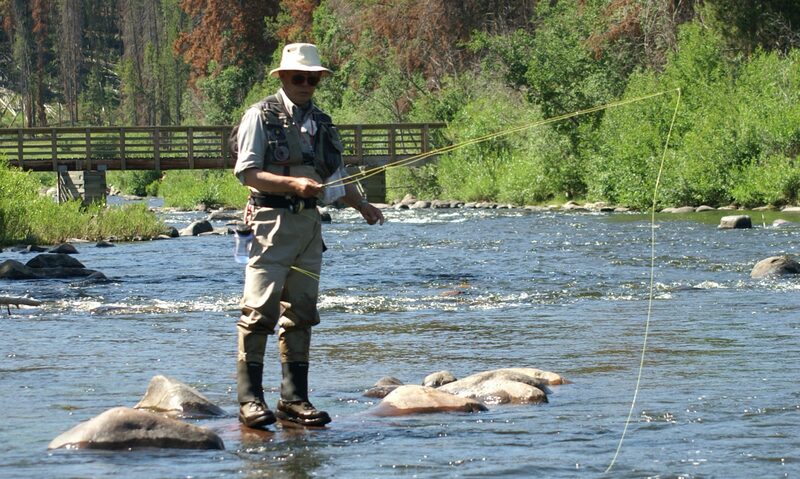 Tie first tail in on your side of the shank. The length of the tail should equal the length of the shank. Two turns of the thread will secure tail in place. 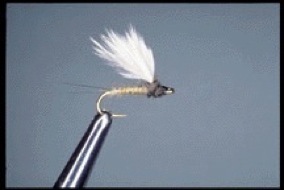 With smaller flies the tails should be tied on sooner (i.e. closer to the eye of the hook) to make sure that they’re adequately secured. Tie second tail in on the far side of the shank. 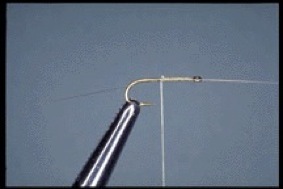 Wrap thread around both tails all the way to the bend of the hook. Another turn must be made under the two tails (between the tails and the shank of the hook). Finally two more turns are needed just to the right of the exposed tails (see picture). Cement at the point of the final two turns. 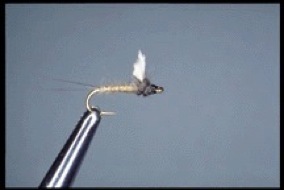 (The last step is done to increase the durability of the fly.) There must be a 60 to 70 degree separation between the two tails. 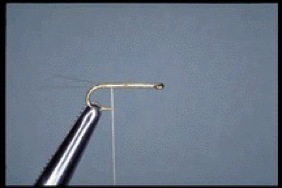 This can be achieved by pressing a finger nail against the thread between the two tails. 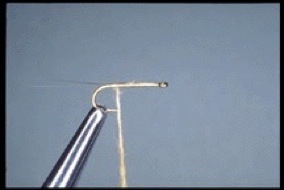 When applying dubbing to the thread use long fibers (this helps avoid a lumpy body). Make fibers line up with the thread. Closer to the hook the dubbing should be tapered thin to achieve a tapered fly body. The top (tapered) portion of the dubbing should be twisted clock-wise around the thread, then with a single turn secured to the shank. Once the dubbing is pinched between the shank and the thread, the remaining dubbing must be twisted counter clock-wise onto the thread as tightly as possible. The dubbing should not come loose since the first turn secured it to the shank. While keeping the twisted dubbing tight wrap under the tails one more time. As you wrap dubbing (without overlapping) toward the thorax portion of the fly, the body should be tapered. It should be slightly thicker near the thorax. The tightly twisted dubbing will create a body that has a segmented look to it and it also makes the fly more durable. Trim the feathers closer to the eye of the hook. Cut the wing by pinching and lifting the feathers straight up and inserting the scissors approaching from the tail end of the fly at an angle. • Hook: Tiemco 101 (straight-eye) hooks. • Tail: Dark dun colored microfibett. • Thread: Unithread 6/0 for hook sizes 14 or larger; Unithread 8/0 for smaller hooks. • Dubbing: Natural or dyed beaver fur. Longer fibers preferred, preferably at least 1/2” long. (Note: Rim uses no dubbing wax. Photographs above of tying by Ray Pong and Bill Cronin (Cronin Photography, Denver). The above color combinations have been known to work well. Other color combinations may also do well in your area. 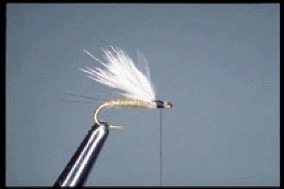 When tying bicolor flies, tie off thread after you secured the wing. The size and color of the flies vary from season to season as well as geographic region. For instructions on dying natural beaver pelts, which can be grey or light brown naturally, when unable find colors of pre-dyed long-haired beaver on the pelt, Rim and I have followed these instuctions: Dying Beaver Fur for Fly Tying. Or you can ask your wife’s hairdresser to do, which I have done as well, and is much easier.